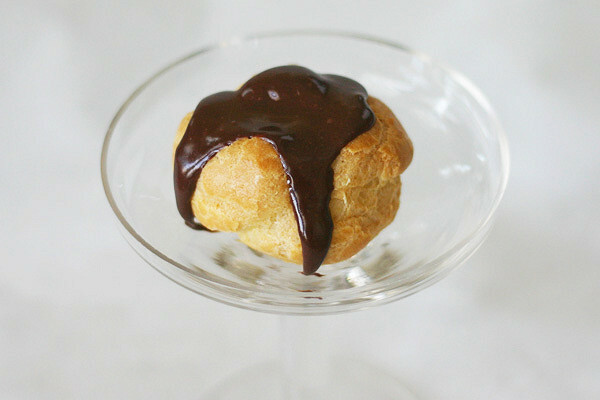 These cream puffs might change your life. Or they might just change your thinking. This recipe will take they mystery out of these decadent delights and you will be confident in bringing this cream filled treat to your next get-together. 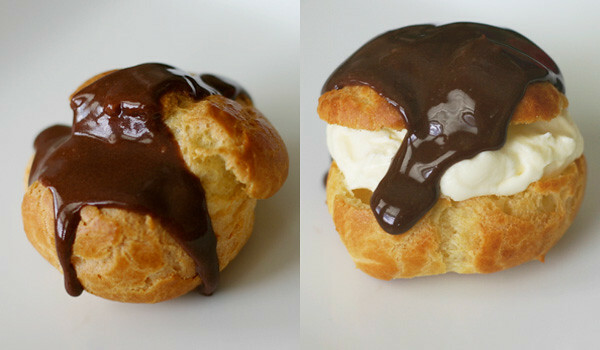 Cream puffs is by far my most requested recipe. But people enquire with angst, thinking they are painstakingly hard to make. 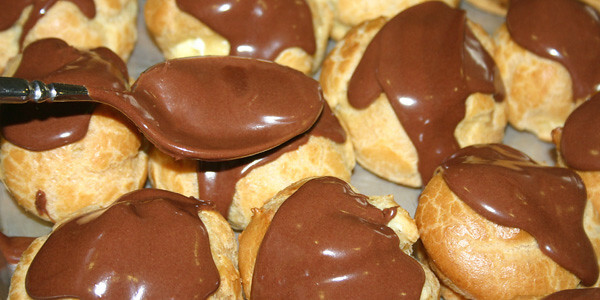 And then I give them recipe with embarrassment because my short-cut way to making cream puffs is soooo EASY! Consider it a semi-homemade/Sandra Lee method if you will. 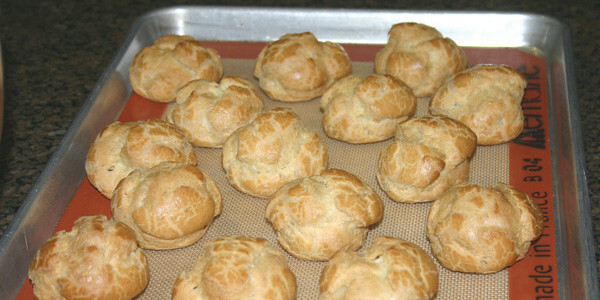 I learned all I know about cream puffs from my mom (it was one of her trademark recipes), Martha, and Alton Brown. 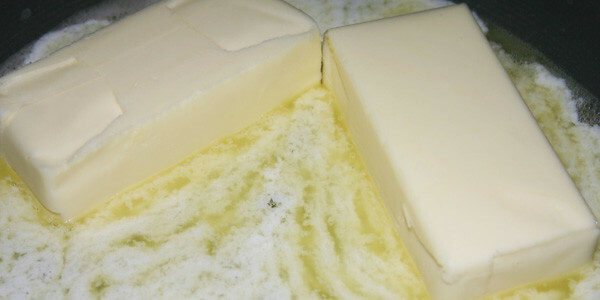 Start by melting 2 sticks (1 cup) of butter in a medium saucepan. After it’s melted, add 2 cups water and bring to a boil. Take off the heat and add 2 cups (plus 2 tablespoons) of flour. Now quickly stir until there’s no lumps and it will roll into a ball. (My kids think that it looks like brains when it’s at this stage). 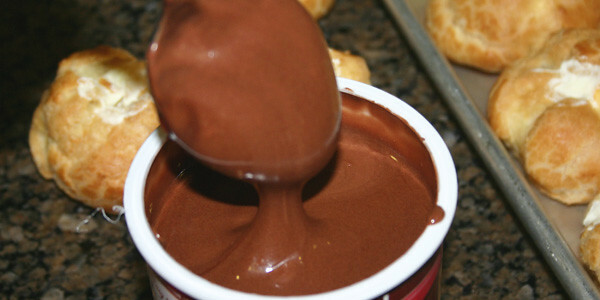 Now put that in a mixer bowl and let it sit for about 5 minutes so its not too hot. Giving it a little mix will speed the cooling process, but don’t mix too much. Use the paddle attachment. Now you need to add 8 eggs. Break them into a separate container and then add them one by one with the mixer on low speed. Add one, then wait until it’s all incorporated to add the next. You can mix this by hand, but only if you belong to a gym. It takes some serious muscle. You have to mix fast so the warm dough doesn’t make scrambled eggs. 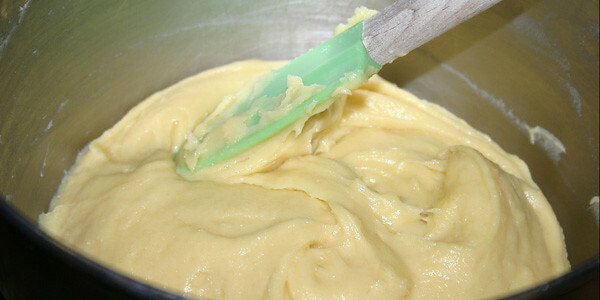 It also gets very slippery until mixed in, so be careful for flying bits of dough if you’re working fast. 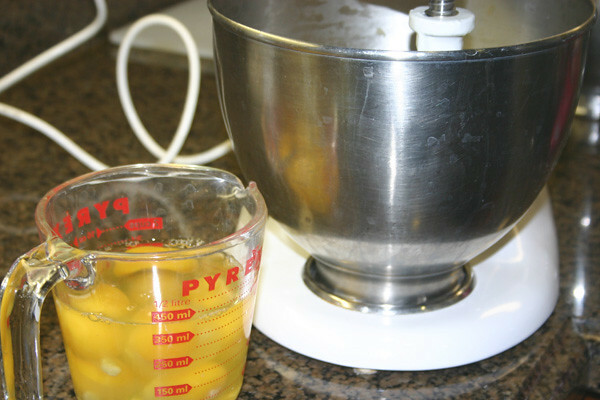 I used to do it by hand until Martha did it in her mixer…way easier! 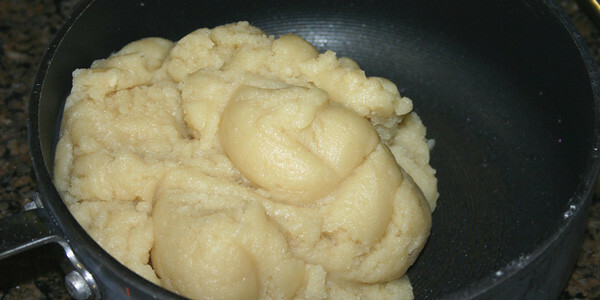 Now you have your pate a choux dough. It is really sticky stuff! My mom used to use the double spoon drop technique, but I like uniform sized cream puffs, so I use a scoop. You can use a small one for bite sized cream puffs or a big one for some monster ones. 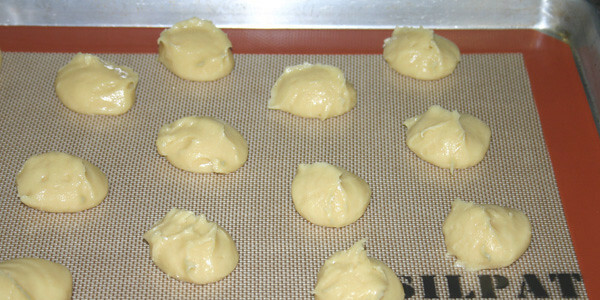 I usually use a medium one (#40) and this makes about 46 cream puffs. I half this recipe if by chance I only need a few, but these are pretty small, so plan on 2 per person if you’re bringing them somewhere. This is where my silpats are the bomb. These sticky things just roll right off if you use these. If you don’t have silpats, line your pans with parchment. Leave plenty of room in between because these things puff up! But do you see the peaks on these? Those peaks will still be there after you bake them, so we need to get rid of them. 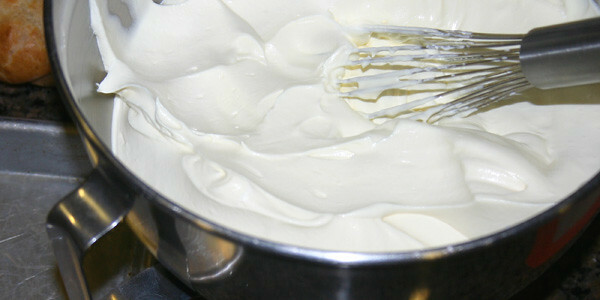 No one wants a sharp edge to poke their mouth amidst tasting that gooey cream! So wet your finger and pat down the peaks. Don’t get too much water on them, just enough for your finger not to stick. Put these babies in the preheated oven (400) and bake for about 25-35 min. They should be nice and golden brown. Not light at all. Now it is important not to open your oven to check them. This will let out the steam that plays a roll in puffing them. It’s a science thing that Alton taught me. Just check with your oven light. My oven cooks really fast, so I check it at 25 min. It will probably take longer. Now while these were in the oven you can make your cream filling. You need a big box of vanilla pudding and a 12 oz container of cool whip. 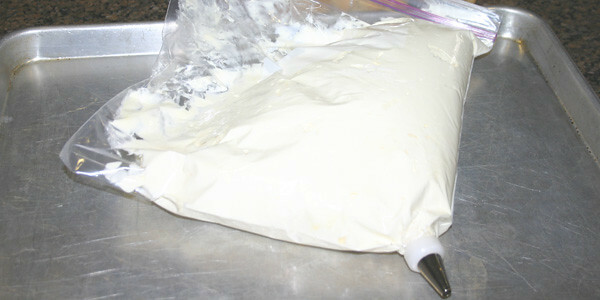 Mix the pudding powder with 2 1/2 cups of milk and let it set in the fridge for about 10-15 minutes. 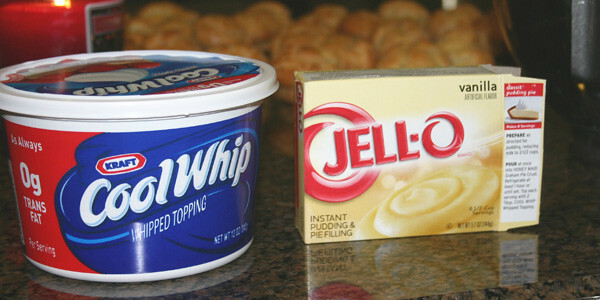 Now mix in your cool whip and you will have this. Put it back in the fridge until your puffs are out of the oven and cooled. You ready to fill them? 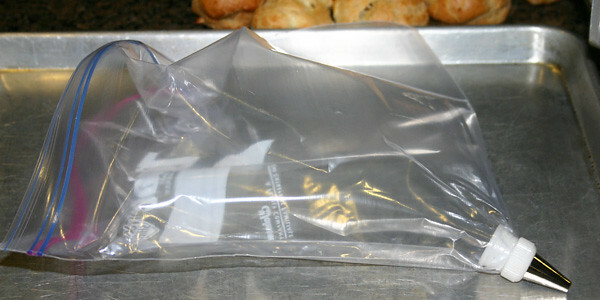 If you don’t keep pastry bags on hand, just use a zip locs. Put a #12 tip on. 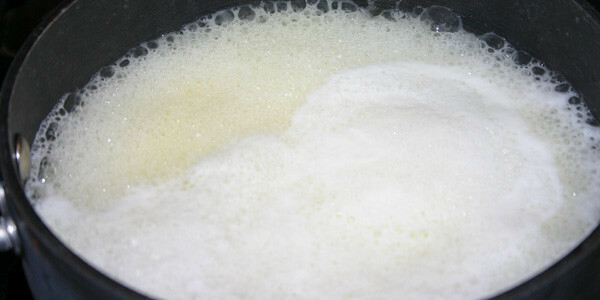 Now find a weak point/crack in the puff, and fill. You can kind of feel it getting heavier and you will be able to tell when it’s full. Now you have filled puffs, but this isn’t very pretty. Let’s cover up that fill spot with chocolate! It doesn’t get faster than this! But I’m warning you that all chocolate frostings are not created equal. 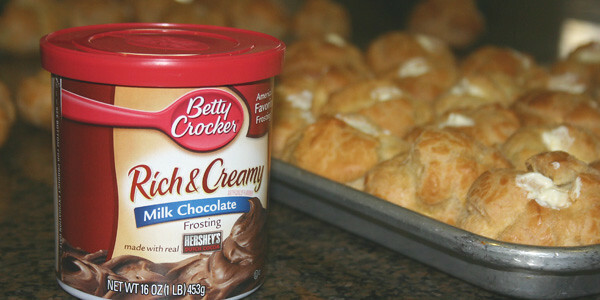 Betty Crocker milk chocolate is my favorite! Take the foil seal off, then put it in the microwave for exactly 30 seconds, then stir. It will be the perfect consistency. Not too thin, but thin enough to spread on the cream puff. I just spread it around with the spoon. This is a messy process, so I don’t do this on the plate I want to serve it on. 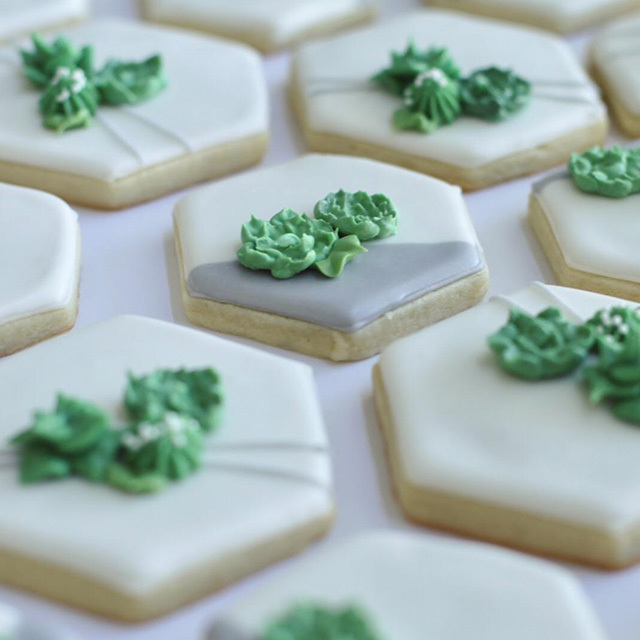 After they have the frosting on, they need to go in the fridge. Then right before I serve, I transfer them to the serving plate. Now if you’re in a hurry, or you just don’t want to deal with tips and bags. You can just slice your puff in half, then fill it with a spoon. Some people take out any extra soft part of the pastry after they’ve opened it. I find that if it puffed up well, there isn’t much to take out. This way is easier and faster, but it does make them a little more messy to eat. So you have a choice to make. But either way, doesn’t it look good? I have a recipe for a vanilla custard creme filling and a homemade chocolate ganache. But I haven’t made them the “food purist” way in a while, because I flat out love the way these taste, the easy way! 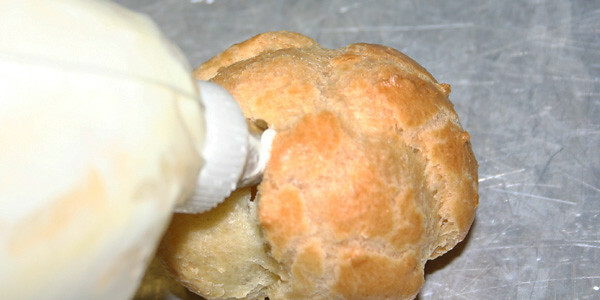 So now you know how to make cream puffs. And guess what? You also know how to make eclairs. They are the same thing. 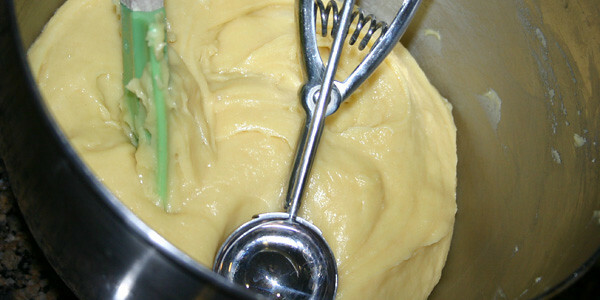 Eclairs are typically made in a bar. 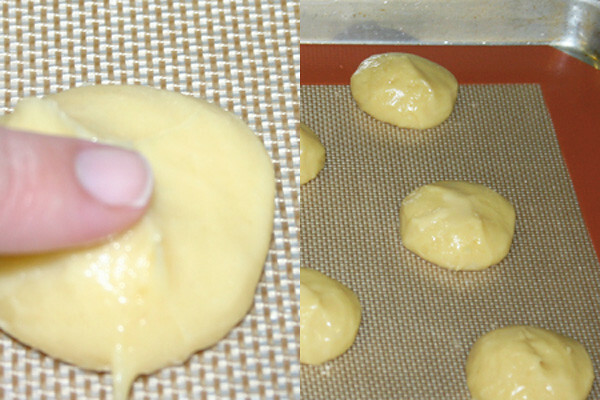 You can just pipe out your pate a choux in a long and narrow shape. Oh, and I can’t forget to mention that you can make savory cream puffs by filling them with a chicken salad, or seafood salad, or anything you want! We love these things around here. My daughter requested these instead of a birthday cake last year. I can’t wait for you guys to try these out. Be sure to let me know if they change your life! I’m linking up to Be Different Act Normal, Tatertots and Jello and Today’s Creative Blog. I think i will make some tonight. But the old fashion way. Its the only way for me, brings back many memories!!! These look sooo good! 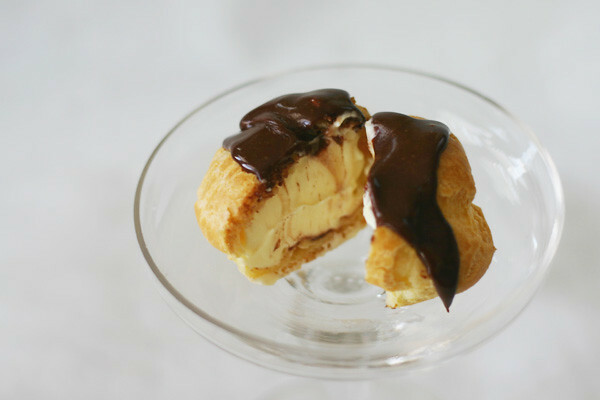 I make an eclair cake using a similar dough. (Kind of like a cream puff but in layer form.) I am looking forward to trying this! Thanks for another great inspiration! These are seriously so amazing! I was shocked when I found out how easy the frosting is, but it is honestly the yummiest thing ever! 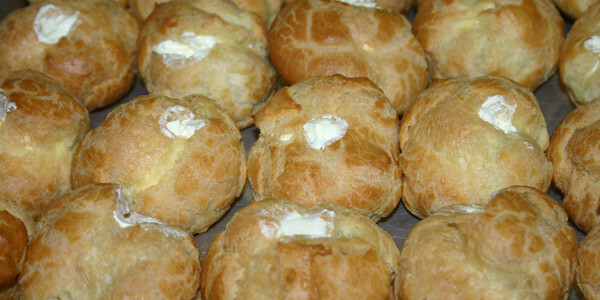 I love cream puffs!! We had them at our wedding, but they were Cosco cream puffs (my fav). I would love to be able to recreate them with ease. I'm not a huge baker but when it's something I love and it's this simple to make, I'm there!! Yum. I think I remember eating ones that your mom made. I shouldn't looked at this while I was fasting. Painful. yum. I like to make eclair cake, I'll have to switch it up and try this sometime. I am drooling reading this and looking at the pictures! I love these and would love to be able to make them for others. I've just read your cream puffs, baseball cookies, and video game party posts. I am very impressed by your talent and creativity. How do you find time to do all of this? I would love it if you checked my blog out at: http://www.meldreamsoften.blogspot.com. 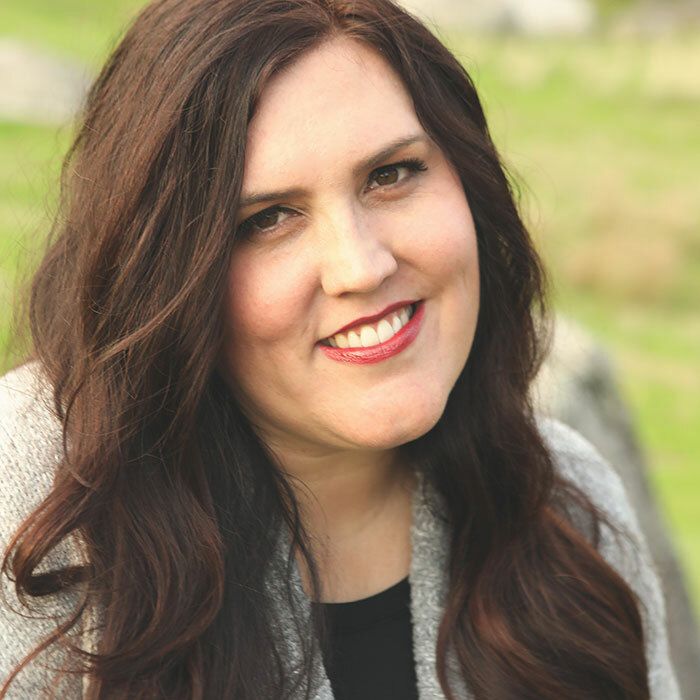 I found you on Ladybird Ln at her Stylish Blogger post. These make me so HUNGRY! Oh my goodness they look so good. I haven't had any since Leah's blessing-that was a whole year ago! Thank you again for giving Natalie and I private lessons. I need to make these soon! oh my goodness!!! this makes me hungry!! These look delicious! I love how you heat up the Betty Crocker frosting! Wow, these look amazing! I am going to have to make them. I just need to come up with an excuse, so that I don't eat all of them myself! I've used this recipe for years — it's a great one! This looks delicious! I'd like to invite you to link it up to my Recipe Exchange! It would be a wonderful addition. Hope to see you there! These look heavenly and I love that you made it easier. I am definitely bookmarking these! ps- Tomorrow I'm featuring lots of recipes from other blogs. I'd love for you to stop by if you get a chance. Have a good one! These were so good Kathryn! I cna't wait to try them. I love learning new stuff like this. Thanks for sharing! Forgive the dumb question but I'm assuming this is self-rising flour? Also, do you need to refrigerate if not served immediately?